It must be more than just sheer coincidence that the worst animated film since "Cool World" is being released alongside one of the most brilliant of the recent past. 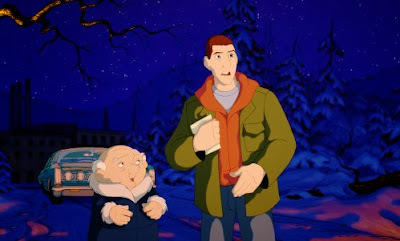 Adam Sandler's aptly-titled "Eight Crazy Nights" finds itself being unleashed on reputable theater screens during the same weekend as Disney's highly-anticipated "Treasure Planet," the first traditional feature cartoon since "Titan A.E." to rise above the mold and pull the viewers into an experience both adventurous and exhilarating. Lumping these two products together, if you think about it, is an ideal marketing campaign—if the moviegoers are going out of their way to see a cartoon during Thanksgiving, do they really care enough to make a choice between two major openings? Of course not. And given the fact that Sandler's name—not to mention the holiday theme—is attached to this one, that's probably exactly what Columbia Pictures is depending on. Not that they could depend on anything else to push this product on unsuspecting viewers. "Eight Crazy Nights" is a shallow, crude, mean-spirited and painfully unfunny excursion into lunacy, driven by an all-too-familiar shtick from beginning to end without so much as a moment of breathing room. And what has been true up until now about the average Sandler comedy is only magnified beyond acceptance here; the jokes aren't just loathsome and cruel, they're aggressively tone-deaf as well. And that, believe it or not, is quite the ambush considering that the actor's most recent product, the P.T. Anderson love story "Punch Drunk Love," seemed to hint that he, like Jim Carrey following "The Truman Show," was more interested in doing something that utilized his talent as an actor. This pile of dreck, however, represents a setback so major, it almost makes "The Waterboy" watchable. Sandler's character is Davey Stone (almost a spitting image of himself), a slacker, a vandal, and a cretin that is always on the wrong side of the law. To top it all off, when he's not breaking the rules (and the property around him), he's tearing down the walls of decency with his rude and disgusting disposition. After being caught by the cops for his latest legal tryst and threatened with a ten-year sentence in the slammer, the local basketball coach, Whitey Duvall, steps up and suggests an alternative plan that could possibly redeem the man from his rebellious nature—he could serve as the coach's own assistant. Of course, where it all goes from there should be a familiar route to those who have seen anything Sandler has done in this genre. Incidentally, he services the voice of three of the film's major characters, each of them equally annoying in their convictions. The hero of the movie is not Davey, as most would have you think, but actually the Whitey character, a short middle-aged bald man with feet that are two different sizes, eyes small enough to almost go unnoticeable, and a voice that sounds vaguely like Sandler's own on helium. The result is not necessarily the most damaging of the lot (Sandler does much worse in fact with Whitey's sister Eleanore, who could pass off as a member of Fran Drescher's family tree), but it does make you wonder exactly what anyone was aiming for with this direction. Whitey isn't cute, funny, or sympathetic in the least, and when the movie pulls out a sentimental twist towards the end designed to sprout some admiration towards him, we wonder why the script even bothers. But "Eight Crazy Nights" has bigger errors to deal with than just miscalculated characterizations. Consider, for instance, the back story behind the Davey character; in flashback sequences that detail his childhood love for the sport of basketball, we learn that his parents were killed in a car accident on their way to his big game, leaving behind only a greeting card in an envelope that the withdrawn guy has since refused to open.The movie needs some kind of gimmick to justify Stone's erratic behavior, yes, but with a scenario as severe as this amongst all sorts of profanity, toilet humor and the "Jackass"-inspired practical jokes, how are we supposed to react, anyway? Watching this bizarre turn of events unfold, the movie makes a drastic shift in tones that it is never able to recover from. and 6) A family of deer that follow Whitey around, assist him whenever he gets caught in major problems, and defecate uncontrollably when a human tells a joke that's too funny for them to handle. Why is the movie even animated to begin with? I gather because director Seth Kearsley feels that he can get away with a lot more in a cartoon rather than in a live action vehicle (hey, if it worked for "South Park," I guess it was worth an attempt). But Mr. Kearsley makes one slight error in judgment that cripples his entire product: he doesn't seem to understand the purpose of laughter. Alas, Sandler still doesn't understand it himself; whenever he appears on screen in a film like this, he barely drudges his way though the mediocre material, sometimes shouting and snapping at his costars like he's an overachiever performing CPR on the dead source material. In any case, if he has searching for solid identity as a comedian, animation hasn't brought him any closer to his goal than live action, so now is the ideal time for him to seek out some major career advice. With any luck, maybe he'll take mine.